On the geology and paleontology of the Cretaceous strata of Kansas. Annual Report of the U.S. Geol. Surv. Terr., 5:318-349, Report for 1871. LEFT: "Cope's restoration of the giant Enaliosaurs, Elasmosaurus platyurus. This highly imaginative sketch of Cope's exaggerates the slender, snakelike character of the neck vertebrae. It bears the inscription, "Elasmosaurus platyurus (Cope) 60 feet in length, flippers like a whale, neck 22 [feet], body 23 [feet]." It was doubtless shown to Charles R. Knight to guide him in his restoration." (Osborne, 1931. Fig. 17). 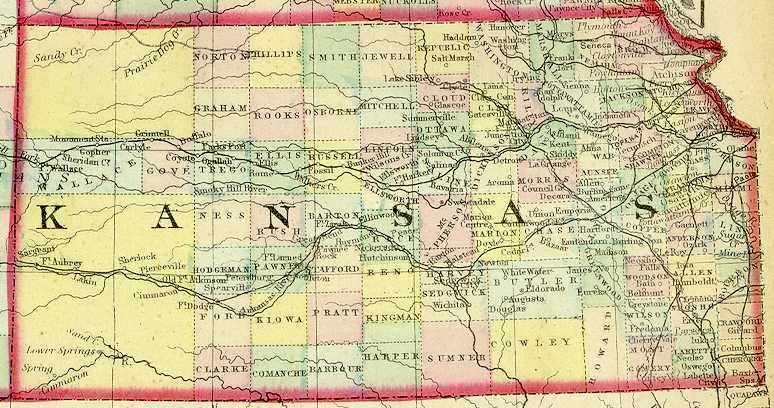 Wherein Professor Cope describes some of the creatures that once lived in the shallow ocean that covered much of the Midwest, and some of the geological features of western Kansas (See 1872 map below). THE CRETACEOUS STRATA OF KANSAS. By EDWARD D. COPE, A. M.
PART I. - A GENERAL SKETCH OF THE ANCIENT LIFE. original positions. In many cases these banks or bluffs have retained their original steepness, and have increased in elevation as the breaking down of the rock encroached on higher land. In other cases the rain-channels have cut in without removing the intervening rocks at once, and formed deep gorges or cañons, which sometimes extend to great distances. They frequently communicate in every direction, forming curious labyrinths, and when the intervening masses are cut away at various levels, or left standing, like monuments, we have the characteristic peculiarities of "bad lands," or mauvaises terres. In portions of Kansas tracts of this kind are scattered over the Country, along the margins of the river and creek valleys and ravines. The upper stratum of the rock is a yellow chalk, the lower bluish, and the brilliancy of the color increases the picturesque effect. From elevated points the plains appear to be dotted with ruined villages and towns whose avenues are lined with painted walls of fortifications, churches, and towers, while side-alleys pass beneath natural bridges or expand into small pockets and caverns, smoothed by the action of the wind carrying hard mineral particles. But this is the least interesting of the peculiarities presented by these rocks. On the level surfaces, denuded of soil, lie huge oyster-like shells, some opened and others with both valves together, like remnants of a half finished meal of some titanic race, who had been frightened from the board never to return. These shells are not thickened like most of those of past periods, but contained an animal which would have served as a meal for a large party of men. One of them measured 26 inches across. 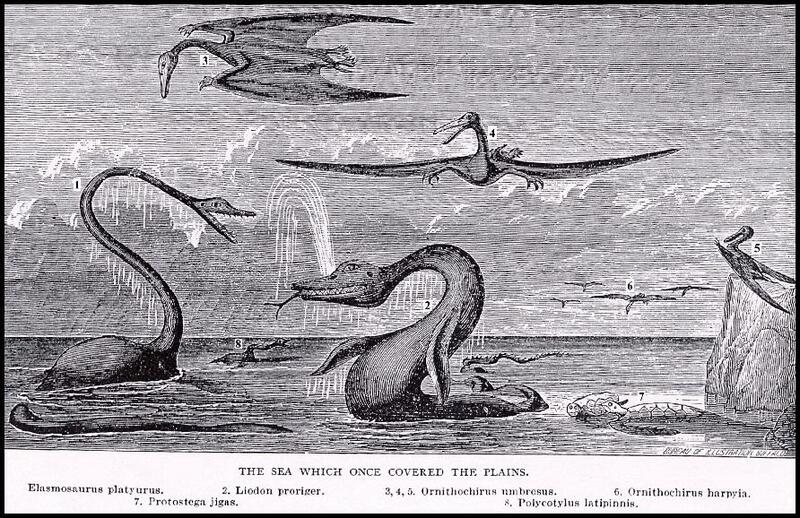 If the explorer searches the bottoms of the rain-washes and ravines, he will doubtless come upon the fragment of a tooth or jaw, and will generally find a line of such pieces leading to an elevated position on the bank or bluff where lies the skeleton of some monster of the ancient sea. He may find the vertebral column running far into the limestone that locks him in his last prison; or a paddle extended on the slope, as, though entreating aid; or a pair of jaws lined with horrid teeth; which grin despair on enemies they are helpless to resist; or he may find a conic mound on whose apex glisten in the sun the bleached bones of one whose last office has been to, preserve from destruction the friendly soil on which he reposed. Sometimes a pile of huge remains will be discovered which the dissolution of the rock has deposited on the lower level, the force of rain and wash having been insufficient to carry them away. 320 GEOLOGICAL SURVEY OF THE TERRITORIES. the coast line extended from Arkansas to near Fort Riley, on the Kansas River, and passing a little eastward traversed Minnesota to the British possessions, near the head of Lake Superior. The extent of sea to the westward was vast, and geology has not yet laid down its boundary; it was probably a shore now submerged beneath the waters of the North Pacific Ocean. Far out on its expanse might have been seen in those ancient days, a huge, snake-like form which rose above. 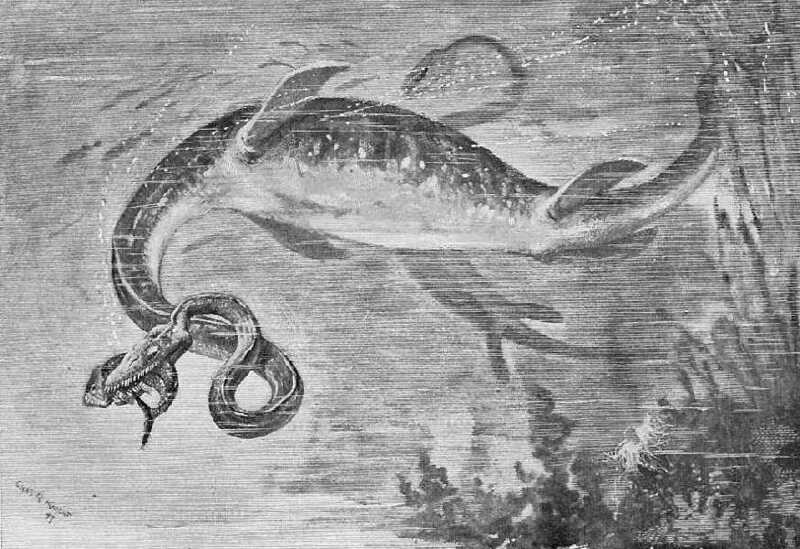 the surface and stood erect, with tapering throat and arrow-shaped head; or swayed about, describing a circle of twenty feet radius above the water. Then it would dive into the depths, and naught would be visible but the foam caused by the disappearing mass of life. Should several have appeared together, we can easily imagine tall, twining forms rising to the height of the masts of a fishing fleet, Or like snakes twisting and knotting themselves together. This extraordinary neck - for such it was - rose from a body of elephantine proportions; and a tail of the serpent- pattern balanced it behind. The limbs were probably two pairs of. paddles like those of Plesiosaurus, from which this diver chiefly differed in the arrangement of the bones of the breast. In the best known species 22 feet represent the neck in a total length of 50 feet. This is the Elasmosaurus platyurus, Cope, a carnivorous sea-reptile, no doubt adapted for deeper waters than many of the others. 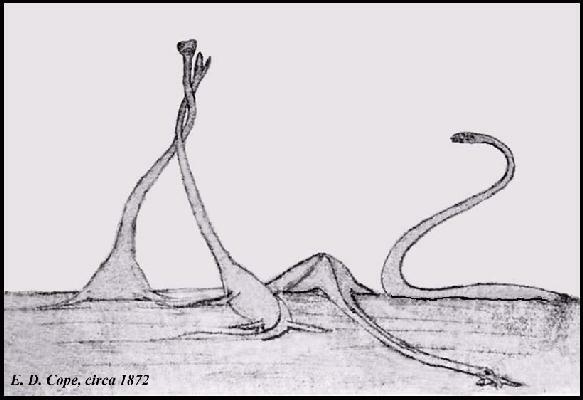 Like the snake-bird of Florida, it probably often swam many feet below the surface, raising the head to the distant air for a breath, then withdrawing it and exploring the depths 40 feet below, without altering the position of its body. From the localities in which the bones have been found in Kansas, it must have wandered far from land, and that many kinds of fishes formed its food is shown by the teeth and scales found in the position of its stomach. .
A second species of somewhat similar character and habits differed very much in some points of structure. The neck was drawn out to a wonderful degree of attenuation, while the tail was relatively very stout, more so, indeed, than in the Elasmosaurus, as though to balance the anterior regions while occupied in various actions; e.g., while capturing its food. This was a powerful swimmer, its paddles measuring four feet in length, with an expanse therefore of about eleven feet. It is known as Polycotylus latipinnis, Cope. The two species just described formed a small representation in our great interior sea, of an order which swarmed, at the same time or near it, over the gulfs and bays of old Europe. There they abounded twenty to one. Perhaps one reason for this was the almost entire absence of the real rulers of the waters of ancient America, viz., the Pythonomorpha. These sea-serpents-for such they were-embrace more than half the species found in the limestone rocks in Kansas, and abound in those of New Jersey and Alabama. Only four have been seen as yet in Europe. creatures, in which they are unique among animals. Swallowing their prey entire like snakes, they were without that wonderful expandability of throat due in the latter to an arrangement of levers supporting the lower jaw. Instead of this each half of that jaw was articulated or jointed at a point nearly midway between the ear and the chin. This was of the ball-and-socket type, and enabled the jaw to make an angle outward, and so widen by much the space enclosed between it and its fellow. The arrangement maybe easily imitated by directing the arms forward, with the elbows turned outward and the hands placed near together. The ends of these bones were in the Pythonomorpha as independent as in the serpents, being only bound by flexible ligaments. By turning the elbows outward and bending them, the space between the arms becomes diamond-shaped and represents exactly the expansion seen in these reptiles, to permit the passage of a large fish or other body. The arms, too, will represent the size of jaws attained by some of the smaller species. The outward movement of the basal half of the jaw necessarily twists in .the same direction the column-like bone to which it is suspended. The peculiar shape of the joint by which the last bone is attached to the skull depends on the degree of twist to be permitted, and therefore to the degree of expansion of which the jaws were capable. As this differs much in the different species, they are readily distinguished by the column or " quadrate" bone when found. There are some curious consequences of this structure; and they are here explained as an instance of the mode of reconstruction of extinct animals from slight materials. The habit of swallowing large bodies between the branches of the under jaw necessitates the prolongation forward of the mouth of the gullet; hence the throat in the Pythonomorpha must have been loose and almost as baggy as a pelican's. Next, the same habit must have compelled the forward position of the glottis or opening of the windpipe, which is always in front of the gullet. Hence these creatures must have uttered no other sound than a hiss, as do animals of the present day which have a similar structure; as, for instance, the snakes. Thirdly, the tongue must have been long and forked, and for this reason: its position was still anterior to the glottis, so that there was no space for it except it were inclosed [sic] in a sheath beneath the windpipe when at rest, or thrown out beyond the jaws when in motion. Such is the arrangement in the nearest living forms, and it is always in these cases cylindric and forked. The giants of the Pythonomorpha of Kansas have been called Liodon proriger, Cope, and Liodon dyspelor, Cope. The first must have been abundant, and its length could not have been far from fifty feet; certainly not less. Its physiognomy was rendered peculiar by a long projecting muzzle, reminding one of that of the blunt-nosed sturgeon of our coast; but the resemblance was destroyed by the correspondingly massive end of the branches of the lower jaw. Though clumsy in appearance, such an arrangement must have been effective as a ram, and dangerous to his enemies in case of collision. The writer once found the wreck of an individual of this species strewn around a sunny knoll beside a bluff, and his conic snout pointing to the heavens formed a fitting monument. as at once his favorite weapon, and the mark distinguishing all his race. 322 GEOLOGICAL SURVEY OF THE TERRITORIES. with teeth, was observed projecting from the side of a bluff by a companion in exploration, Lieutenant James H. Whitten, United States Army, and we at once proceeded to follow up the indication with knives and picks. Soon the lower jaws were uncovered, with their glistening teeth, and then the vertebræ and ribs. Our delight was at its height when the bones of the pelvis and part of the hind limb were laid bare, for they had never been seen before in the species and scarcely in the order. While lying on the bottom of the Cretaceous sea, the carcass had been dragged hither and thither by the sharks and other rapacious animals, and the parts of the skeleton were displaced and gathered into a small area. The massive tail stretched away into the bluff, and after much laborious excavation we left a portion of it to more persevering explorers. The species of Clidastes did not reach such a size as some of the Liodons, and were of elegant and flexible build. To prevent their habits of coiling from dislocating the vertebral column, these had an additional pair of articulations at each end, while their muscular strength is attested by the elegant striæ and other sculptures which appear on all their bones. Five species of this genus occur in the Kansas strata, the largest (Clidastes cineriarum., Cope) reaching 40 feet in length. The discovery of a related species (Holcodus coryphæus, Cope) was made by the writer under circumstances of difficulty peculiar to the plains. 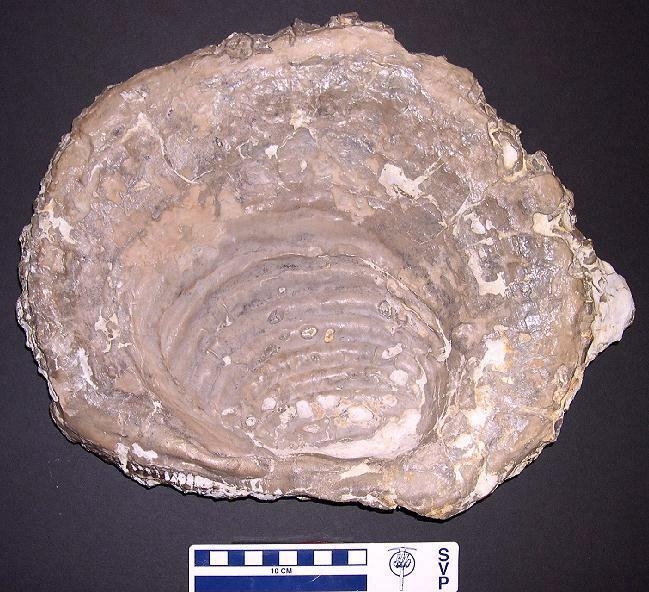 After examining the bluff's for half a day without result, a few bone fragments were found in a wash above their base. Others led the way to a ledge 40 or 50 feet from both summit and foot, where, stretched along in the yellow chalk, lay the projecting portions of the whole monster. A considerable number of vertebræ were found preserved by the protective embrace of the roots of a small bush, and when they were secured, the pick and knife were brought into requisition to remove the remainder. About this time one of the gales, so common in that region, sprang up, and, striking the bluff fairly, reflected itself upward. So soon as the pick pulverized the rock, the limestone dust was carried into eyes, nose, and every available opening in the clothing. I was speedily blinded, and my aid disappeared in the cañon, and was seen no more while the work lasted. Only the enthusiasm of the student could have endured the discomfort, but to him it appeared a most unnecessary "conversion of force" that a geologist should be driven from the field by his own dust. A handkerchief tied over the face and pierced by minute holes opposite the eyes, kept me from total blindness, though dirt in abundance penetrated the mask. But a fine relic of creative genius was extricated from its ancient bed, and one that leads its genus in size and explains its structure. On another occasion, riding along a spur of a yellow chalk bluff, some vertebræ lying at its foot met my eye.. An examination showed that the series entered the rock, and, on passing round to the opposite side, the jaws and muzzle were seen projecting from it, as though laid bare for the convenience of the geologist. The spur was small and of soft material, and we speedily removed it in blocks, to the. level of the reptile, and took out the remains as they laid across the base from side to side. .
up beneath a ledge of rock, with its skull lying undisturbed in the center. A species distinguished for its small size and elegance is Clidastes pumilus, Marsh. This little fellow was only 12 feet in length, and was probably unable to avoid occasionally furnishing a meal for some of the rapacious fishes which abounded in the same ocean. The flying saurians are pretty well known from the descriptions of European authors. Our Mesozoic periods had been thought to have lacked these singular forms until Professor Marsh and the writer discovered remains of species in the Kansas chalk. Though these are not numerous, their size was formidable. One of them, Ornithochirus harpyia, Cope, spread eighteen feet between the tips of its wings, while the O. umbrosus, Cope, covered nearly twenty-five feet with his expanse. These strange creatures flapped their leathery wings over the waves, and often plunging, seized many an unsuspecting fish; or, soaring. at a safe distance, viewed the sports and combats of the more powerful saurians of the sea. At night-fall, we may imagine them trooping' to the shore, and suspending; themselves to the cliffs by the claw-bearing fingers of their wing-limbs. 324 GEOLOGICAL SURVEY OF THE TERRITORIES. turtles should be but just hatched, and for this and other reasons it has been concluded that this "ancient mariner" is one of those forms not uncommon in old days, whose incompleteness in some respects points to the truth of the belief that animals have assumed their modern perfections by a process of growth from more simple beginnings. The Cretaceous ocean of the West was no less remarkable for its fishes than for its reptiles. Sharks do not seem to have been so common as in the old Atlantic, but it swarmed with large predaceous forms related to the salmon and saury. Vertebræ and other fragments of these species project from the worn limestone in many places. I will call attention to perhaps the most formidable as well as the most abundant of these. It is the one whose bones most frequently crowned knobs of shale, which had been left standing amid surrounding destruction. The density and hardness of the bones shed the rain off on either side, so that the radiating gutters and ravines finally isolated the rock mass from that surrounding. The head was as long or longer than that of a fully grown grizzly bear, and the jaws were deeper in proportion to their length. The muzzle was shorter and deeper than that of a bull-dog. The teeth were all sharp cylindric fangs, smooth and glistening, and of irregular size. At certain distance in each jaw they projected three inches above the gum, and were sunk one inch into the jaw margin, being thus as long as the fangs of a tiger, but more slender. Two such fangs crossed each other on each side of the middle of the front. This fish is known as Portheus molossus, Cope. Besides the smaller fishes, the reptiles no doubt supplied the demands of his appetite. The ocean in which flourished this abundant and vigorous life, was at last completely inclosed on the west by elevations of sea-bottom, so that it only communicated with the Atlantic and Pacific at the Gulf of Mexico and the Arctic Sea. The continued elevation of both eastern and western shores contracted its area, and when ridges of the sea- bottom reached the surface, forming long, low bars, parts of the water-area were inclosed and connection with salt-water prevented. Thus were the living beings imprisoned and subjected to many new risks to life. The stronger could more readily capture the weaker, while the fishes would gradually perish through the constant freshening of the water. With the death of any considerable class the balance of food-supply would be lost, and many larger species would disappear from the scene. The most omnivorous and enduring would longest resist the approach of starvation, but would finally yield to inexorable fate; the last one caught by the shifting bottom among shallow pools, from which his exhausted energies could not extricate him. * Notes on the Geology of the Survey for the Extension of the Union Pacific Road, Eastern Division, from the Smoky Hill to the Rio Grande. By John L, Leconte, M. D., Philadelphia, 1868.
constitute the bluffs, and continue to do so as far as Fort Harker, thirty-three miles farther west. They are "a coarse, brown sandstone, containing irregular concretions of oxide of iron," and numerous mollusks of marine origin. Near Fort Harker certain strata contain large quantities of the remains (leaves chiefly) of dicotyledonous and other forms of land vegetation. Near this point, according to the same authority, the sandstone beds are covered with clay and limestone. These he does not identify, but portions of it from Bunker Hill, thirty-four miles west, have been identified by Dr. Hayden as belonging to the Benton or second group. The specimen consisted of a block of dark bluish-gray clay rock, which bore the remains of the fish Apsopelix sauriformis, Cope. That the eastern boundary of this bed is very sinuous is rendered probable by its occurrence at Brookville, eighteen miles to the eastward of Fort Harker, on the railroad. In sinking a well at this point, the same soft, bluish clay rock was traversed, and at a depth of about 30 feet the skeleton of a saurian of the crocodilian order was encountered, the Hyposaurus Vebbii, Cope. The boundary line or first appearance of the beds of the Niobrara division has not been pointed out, but at Fort Hays, seventy miles west of Fort Harker, its rocks form the bluffs and outcrops everywhere. From Fort Hays to Fort Wallace, near the western boundary of the State, one hundred and thirty-four miles beyond, the strata present a tolerably uniform appearance. They consist of two portions - a lower of dark bluish calcareo-argillaceous character, often thin-bedded; and a superior, of yellow and whitish chalk, much more heavily bedded. Near Fort Hays the best section may be seen at a point eighteen miles north, on the Saline River. Here the bluffs rise to a height of 200 feet, the yellow strata constituting the upper half. No fossils were observed in the blue bed; but some moderate-sized Ostrea, frequently broken, were not rare in the yellow. Half-way between this point and the fort, my friend N. Daniels, of Hays, guided me to a denuded tract covered with the remains of huge shells described by Mr. Conrad, at the close of this section, under the names of Haploscapha grandis and H. eccentrica. They may have affinities to the Rudistes; some of them are 27 inches in diameter. They exhibited concentric obtuse ridges on the interior side, and one species a large crest behind the hinge. Fragments of fish vertebræ of the Anogmius type were also found here by Dr. Janeway. These were exposed in the yellow bed. Several miles east of the post, Dr. J. H. Janeway, post-surgeon, pointed out to me an immense accumulation of Inoceramus problematicus in the blue, stratum. This species also occurred in abundance in the bluffs west of the fort, which were composed of the blue bed, capped by a thinner layer of the yellow. Large globular or compound globular argillaceous concretions coated with gypsum were abundant at this point. Along the Smoky Hill River, thirty miles east of Fort Wallace, the south bank descends gradually, while the north bank is bluffy. This, with other indications, points to a gentle dip of the strata to the northwest. The yellow bed is thin or wanting on the north bank of the Smoky, and is not observable on the north fork of that river for twenty miles northward or to beyond Sheridan Station on the Kansas Pacific Railroad. Two isolated hills, "The Twin Buttes," at the latter point, are composed of the blue beds, here very shaly, to their summits. This is the general character of the rock along and north of the railroad between this point and Fort Wallace. 326 GEOLOGICAL SURVEY OF THE TERRITORIES. by bluffs of from 20 to 150 feet in height on its southern side, while the northern rises gradually into the prairie. These bluffs are of yellow chalk, except from ten to forty feet of blue rock at the base, although many of the cañons are excavated in the yellow rock exclusively. The bluffs of the upper portion of Butte Creek, Fox and Fossil Spring (five miles south) Cañons are of yellow chalk, and the reports of several persons stated that those of Beaver Creek, eight miles south of Fossil Spring, are exclusively of this material. Those near the mouth of Beaver Creek, on the Smoky, are of considerable height, and appear, at a distance, to be of the same yellow chalk. I found these two strata to be about equally fossiliferous, and am unable to establish any paleontological difference between them. They pass into each other by gradations in some places, and occasionally present slight laminar alternations at their line of junction. I have specimens of Cimolichthys semianceps, Cope, from both the blue and yellow beds, and vertebræ of the Liodon glandiferus, Cope, were found in both. The large fossil of Liodon dyspelor, Cope, was found at the junction of the beds, and the caudal portion was excavated from the blue stratum exclusively. Portions of it were brought east in blocks of this material, and these have become yellow and yellowish on many of the exposed surfaces. The matrix adherent to all the bones has become yellow. A second incomplete specimen, undistinguishable from this species, was taken from the yellow bed. As to mineral contents, the yellow stratum is remarkably uniform in its character, The blue shale, on the contrary, frequently contains numerous concretions, and great abundance of thin layers of gypsum and crystals of the same, near Sheridan, concretions and septaria are abundant. In some places the latter are of great size, and being imbedded in the stratum have suffered denudation of their contents, and the septa standing out form a huge honey-comb. This region, and the neighborhood of Eagle Tail, Colorado, are noted for the beauty of their gypsum crystals, the first abundantly found in the Cretaceous formation. These are hexagonal-radiate, each division being a pinnate or feather-shaped lamina of twin rows of crystals. The clearness of the mineral and the regular leaf and feather forms of the crystals give them much beauty. The bones of vertebrate fossils preserved in this bed are often much injured by the gypsum formation which covers their surface, and often penetrates them in every direction. The yellow bed of the Niobrara group disappears to the southwest, west, and northwest of Fort Wallace beneath a sandy conglomerate of uncertain age. In color it is light, sometimes white, and the component pebbles are small and mostly of white quartz. The rock weathers irregularly into holes and fissures, and the soil covering it is generally thin and poor. It is readily detached in large masses, which roll down the bluffs. No traces of life were observed in it, but it is probably the eastern margin of the southern extension of the White River Miocene Tertiary stratum. This is at least indicated by Dr. Hayden in his geological preface to Leidy's Extinct Mammals of Dakota and Nebraska. Economically the beds of the Niobrara formation possess little value except when burned as a fertilizer. The yellow chalk is too soft in many places for buildings of large size, but it will answer well for those of moderate size. It is rather harder at Fort Hays, as I had occasion to observe at their quarry. That quarried at Fort Wallace does not appear to harden by exposure; the walls of the hospital, noted by LeConte on his visit, remained in 1871 as soft as they were in 1867. 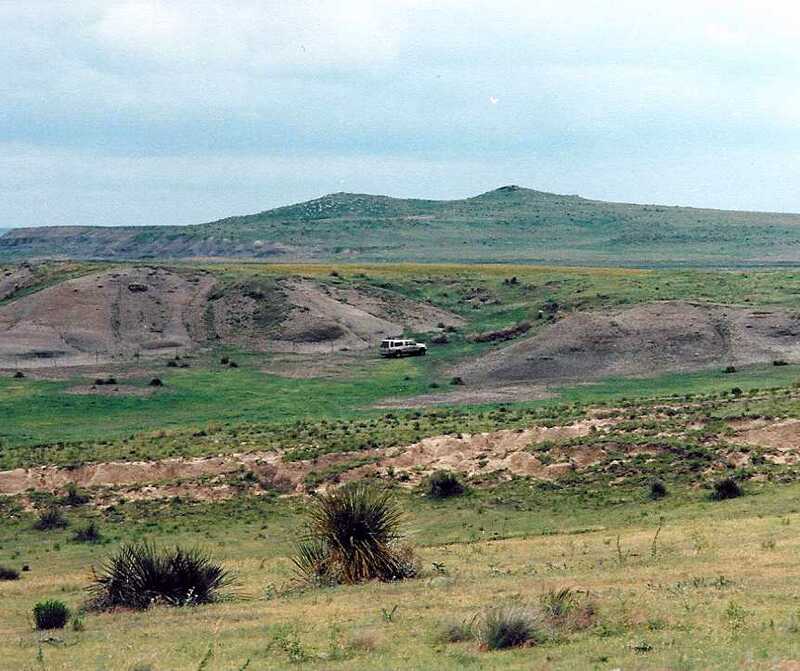 A few worthless beds of bituminous shale were observed in Eastern Colorado. The only traces of glacial action in the line explored were seen near Topeka. South of the town are several large, erratic masses of pink and bloody quartz, whose surfaces are so polished as to appear as though vitrified. They were transported, perhaps, from the Azoic area near Lake Superior. PART III --- SYNOPSIS OF THE FAUNA.